For springtime color in your Georgia garden, plant bulbs, flowering shrubs and annuals. Bulb plants include rhizomes, tuberous plants and true bulbs and will reappear each year on your landscape. Flowering shrubs bloom for three to four weeks, on average, and are available in a wide variety of colors. Annual plants bloom for one season only, but the flowers can last longer than perennial blooming bulb plants. Azaleas are a common sight in many Georgia landscapes. Azaleas are a deciduous shrub with clusters of colorful blooms. Most blooming times for Azaleas range during April and May, but some species begin blooming as early as March and others can bloom into the fall. Azaleas native to Georgia that bloom in April and May include the golden yellow R. austrinum, the yellow, salmon or deep pink R. flammeum, the white to deep violet R. Periclymenoides and the pink R. prinophyllum. Hyacinth (Hyacinthus orientalis) blooms during mid-spring in Georgia, often during April. Available in a variety of colors, hyacinths are fragrant flowers that can grow up to 10 inches tall. The cluster of blossoms grow atop stiff green foliage. Hyacinths bloom from bulbs planted during the fall. Late blooming tulip varieties -- Tulipa -- bloom during April and May in Georgia. 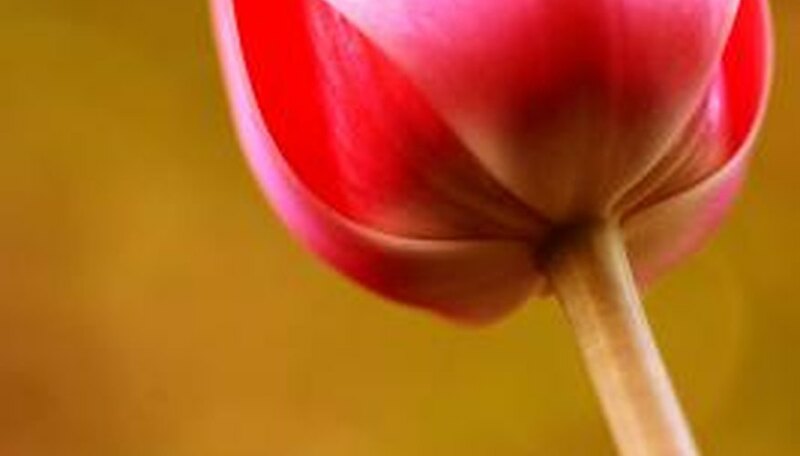 Tulips also have a wide array of available colors and can grow between 3 and 30 inches tall. Plant tulip bulbs in the fall for April and May flowers. Lily-of-the-valley -- Convallaria majals -- blooms in late spring with white, bowl-shaped flowers. Lily-of-the-valley grow from rhizomes, a type of bulb, and can reach heights up to 8 inches. Spanish bluebell (Endymion hispanicus) is another late blooming flower during the Georgia spring. Also called the wood hyacinth, Spanish bluebells can grow up to 18 inches tall with broad bell-shaped flowers in shades of blue, pink and white. The flowers hang in clusters atop thick, green stems. A variety of iris (Iris) species and hybrids thrive in Georgia. The larger species of iris that grow from rhizomes such as bearded iris, Siberian iris and Japanese iris bloom from April to mid-summer. Iris blooms have six petals, three upright and three hanging. Iris can range from 8 to 38 inches tall. Corn flowers -- Centaurea cyanus -- are annual plants that bloom in a Georgia garden from March to May. Corn flowers are also called bachelor’s buttons due to the long-lasting quality of the flower after it is cut and used as a boutonniere. Corn flowers prefer full sun. Larkspur (Dephinium spp.) is another annual bloomer that flowers in April and May in Georgia. The tall, stately spike plants bloom with big flowers in colors that include pink, blue, white and lavender. Larkspur prefers full sun, but can grow in partial shade.